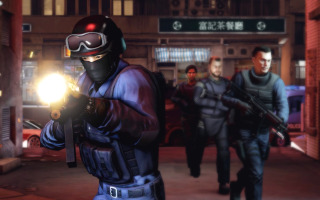 Undercover Detective Wei Shen's Triad shenanigans in Sleeping Dogs involve plenty of activities beyond strong-arming street vendors and butterfly-kicking random civilians, and he'll soon have more diversions at his disposal. Developer United Front Games and publisher Square Enix plan a bevy of DLC content in October to furnish the open-world action-adventure with additional racing activities, cop missions, and weapons across five content packs releasing throughout the month. The teaser trailer above touches on what each pack offers, but the announcement from Square Enix drifted on details like a souped-up Audi. Speaking of drifting, however, we do know the Street Racer Pack peppers racing missions throughout the dense Hong (Honk?) Kong roads. If that sounds a little too hooligan-y, the SWAT Pack returns Shen to the force with 20 new cop missions awaiting sweet street justice, though an extra wait nets you the awesome armory of the Tactical Soldier pack which brings "the game's most powerful weapons and armor." Lastly, a free Community Gift Pack gives "tailor-made content" to players straight from United Front. What that content entails isn't known yet, but we hope United Front takes a page from Saints Row and gives us giant fist-gloves for Shen. Square Enix also hinted at a story-driven DLC appearing sometime in October but won't elaborate until a special panel at New York Comic Con on October 14. Speculation alert: John Woo punches Shen in the face after sliding down a banister as doves majestically flap away in slow motion. No other details on specific release dates and pricing, but previous DLC suggests a price tag of around $3-$5.